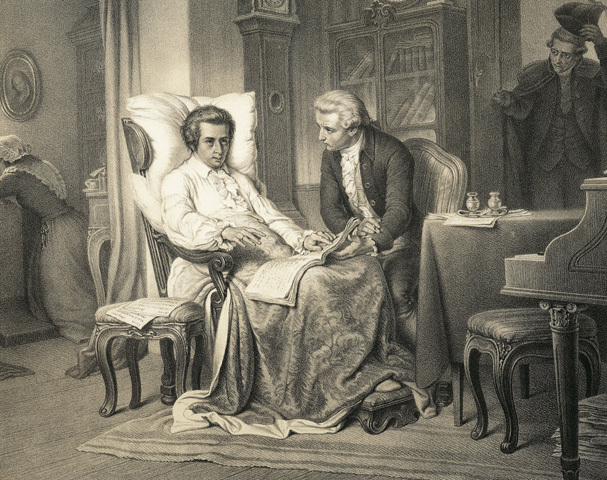 A romanticized depiction of Mozart composing the Requiem by anonymous (19th Century). Image: BBC. Today's date resonates throughout music history as a host to one of its greatest tragedies. It was on this day in 1791 that Wolfgang Mozart died. He was only 35 years old. The 221 years which have passed hardly matter. To those who adore his music the world over, his loss is felt strongly and tenderly. On dates like these, my creative benevolence goes into overdrive. I want to give more Mozart to the world. I'm hard-wired to think in terms of people, the human interest factor, when it comes to preservation. The origins of music are social. 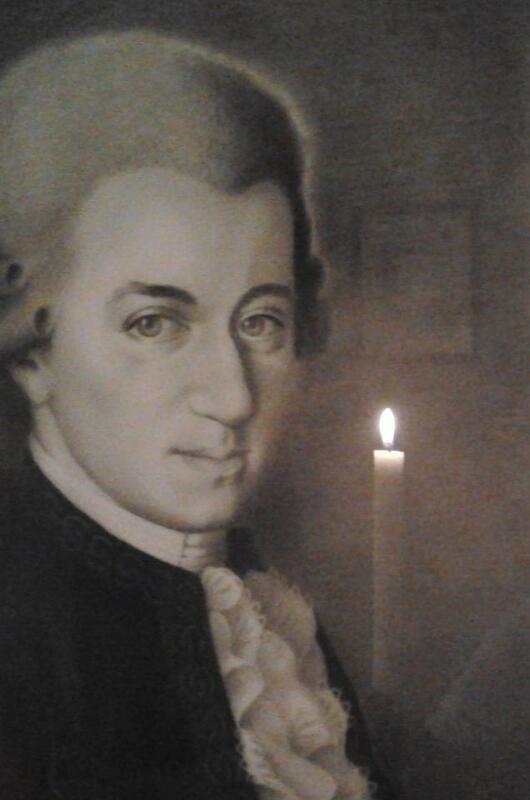 Humanity is all the more brighter and beautiful for Mozart's storied presence and music. The man was imperfect, but his music was divine. Commonplace is this understanding of great art and artists, but lest we forget that his story is also ours. 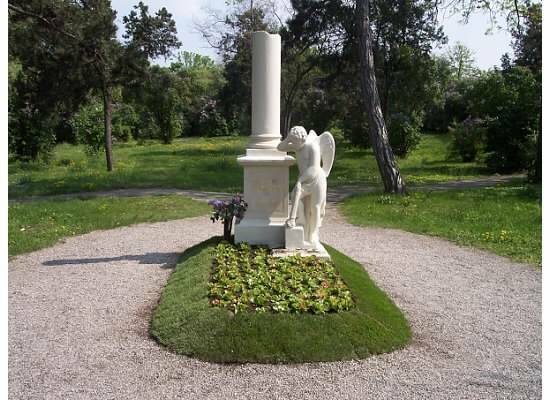 A photo taken by my sister from our most recent visit to Mozart's memorial in Vienna on a spring day. This morning, I lit a candle and joined at least 70 others around the world who agreed to illuminate for Mozart (local time) through the vigil platform that I created on Facebook. I asked participants to light their candles at 12:20 am and extinguish their flames at 12:55 am. The 35 minute duration represented Mozart's 35 years of life and 12:55 am represented the time that his light left our world on December 5, 1791. Many participants shared expressive and heartfelt words as well as photos of their glowing candles. It was a reverent, yet warm experience which marked the beginning of new friendships. 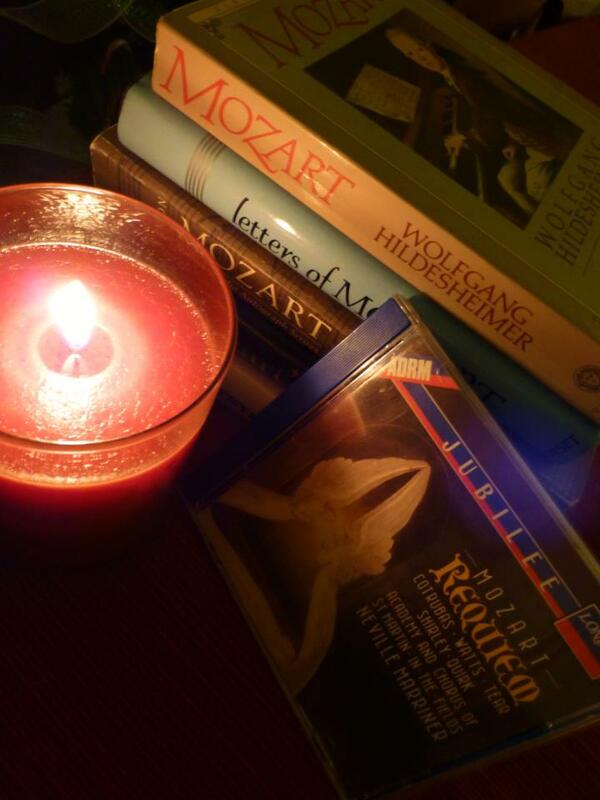 I plan to continue the vigil annually in hopes of making a contribution to establish this new Mozart tradition. Monica Carvalho (Sweden) drew a stunningly beautiful original artwork for the vigil. Lorraine Dyba (Illinois) compiled favorites from her Mozart collection for the vigil. The candlelight vigil reminded me of the news that Vienna, and the world, awakened to the next day. An excerpt from H.C. Robbins Landon's book, 1791: Mozart's Last Year, gives us a personal account of how Ludwig Gall, one of Mozart's students, discovered the news. He "came into town from the Landstrassse to go to the music-dealer Lausch, and when I arrived he said, 'Imagine what a misfortune has happened to us: Mozart died this last night!' Quite appalled I rushed at once to the apartment, still doubting the Job's News, but alas I was soon convinced of its truth. Madame Mozart herself opened the door of the apartment and led me to a little room on the left, where I saw the dead Master on the bier, lying in a coffin, in a black suit with a cowl down over his forehead, hiding his blonde hair, with his hands folded over his breast..."
Invigorated by the sense of community surrounding the vigil, it came to mind that this anniversary also offered a great opportunity to direct my energy towards building a resource for audiences. 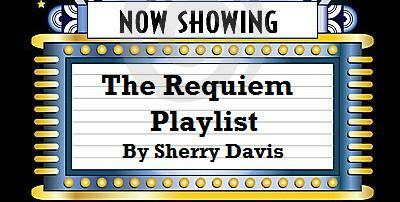 The idea seemed to already be waiting on me: a playlist, of course! 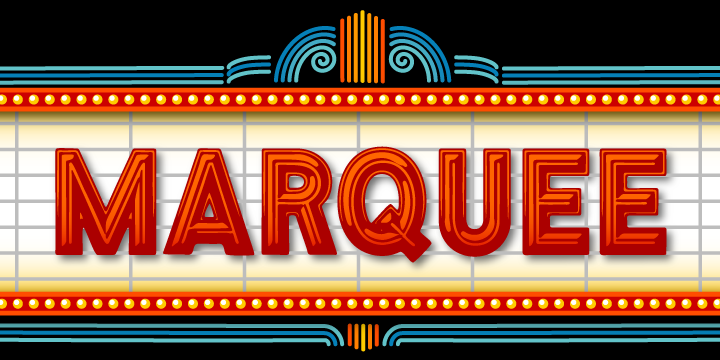 The end result is a collection of videos that inform, entertain and inspire. Despite subject knowledge, this compilation is to be enjoyed and consulted by anyone who has an appreciation for this history. Mozart for all! Aahhhhhhh! I can finally watch them ALL :D Thanks for helping me understand what was going on:) They truly are gems - all of them! I forgot the say that I really loved the drawing on the top part of the article. WOW! Great choice. It is 'juicy' to look at. All the little details are so impecably worked through! The Requiem brings tears to my eyes every time... a well written and well deserved (as far as Mozart's concerned) article! Thank you for participating in the vigil, Monica, and for sharing your candlelit moment with us through your beautiful artwork of Mozart. :) I'm glad that you're able to access all of the video links now and enjoy them. As an artist yourself, I was hoping that you'd like the drawing I selected for this article. There are many depictions of Mozart composing the Requiem, but this one is by far my favorite! Thank you for reminding us of the Haydn account, Jose, which foreshadows Mozart's death, and also for sharing his first symphony which foreshadows the brilliant career that was yet to come for the child prodigy.